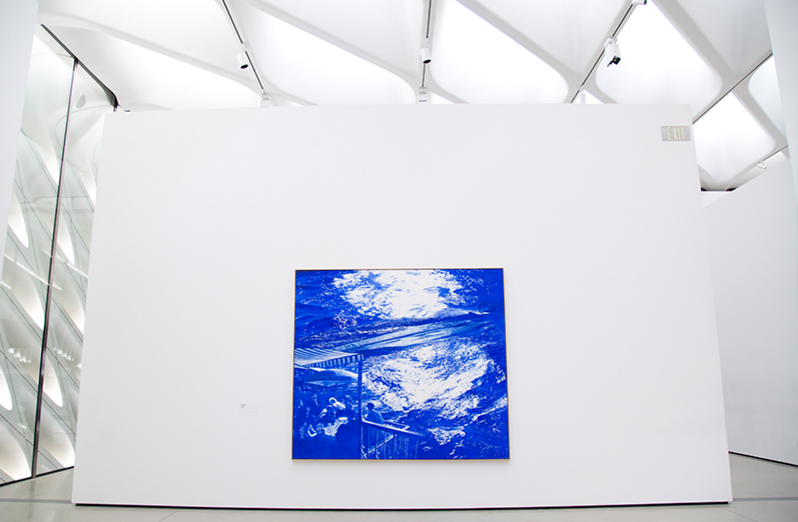 The Broad’s third-floor galleries display a robust and changing selection of works from the Broad collection and are accessible with free general admission. Mark Tansey’s “The Wake” (above) is on display. Now on view in the third-floor galleries is a selection of works from the Broad collection. Mark Tansey's Wake, 2003 is a tribute to his father, art historian Richard G. Tansey, who had passed away in 1998. Mark was raised in a culturally rich environment, and his painting, Wake, reflects that, functioning across multiple levels of puns on the word "wake." In the work, Mark Tansey has gathered a group of people to observe the progression of a boat over water at twilight, presumably a boat carrying his father. The wake of the boat is a funereal wake, and the author of Finnegan's Wake , James Joyce, can be seen through an anamorphic image in the water. 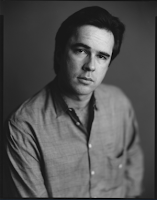 Joyce was Richard Tansey's favorite author and also appears to the far left in the group on the bank of the water. The people are somber and reflective, but the composition of their gathering is taken from Pierre-Auguste Renoir's 1882's Luncheon of the Boating Party, often considered a light-hearted look into the leisure life of 19th century Parisians. The reference to such a joyous painting gives the impression that Tansey's "wake" for his father is more the celebration of a life than the commemoration of a death. 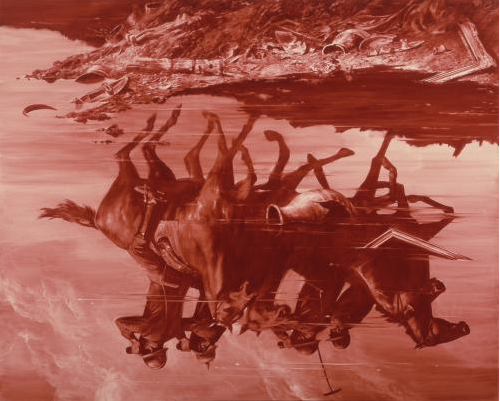 American Mark Tansey’s approach to painting reflects a deep knowledge of art, as many of his motifs are either lifted from historical paintings or depict important artists and philosophers. Each of Tansey’s paintings is a carefully calculated allegory about the meaning of art and the mystery of the human impulse to make images. Rendered in a single hue, Tansey’s canvases achieve a precise photographic quality through a complex process involving the washing, brushing, or scraping of monochromatic paint into gesso. Tansey’s subjects are fantastic, sometimes surreal scenes in which intellectual theories about art are dramatized, often complete with portraits of characters drawn from the discipline’s history. 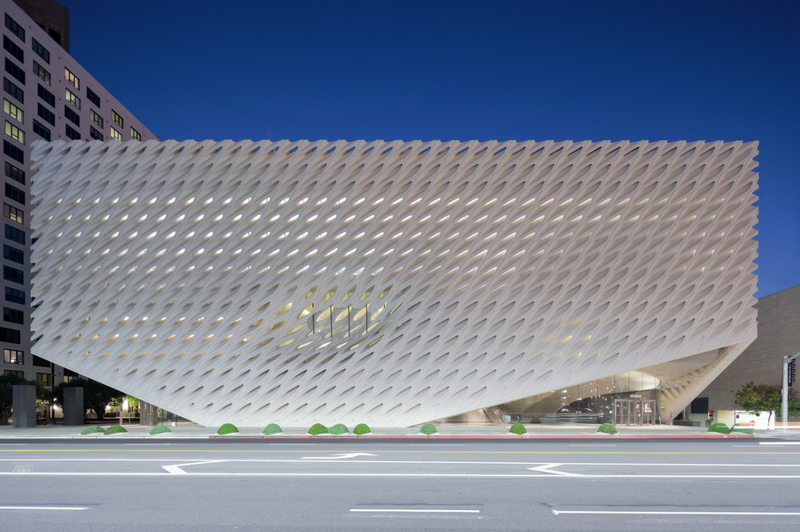 The Broad is a new contemporary art museum founded by philanthropists Eli and Edythe Broad located at 221 S. Grand Avenue in downtown Los Angeles, which opened in September of 2015. The museum is designed by Diller Scofidio + Renfro in collaboration with Gensler and offers free general admission. The museum is home to the 2,000 works of art in the Broad collection, which is among the most prominent holdings of postwar and contemporary art worldwide, and has launched an active program of rotating temporary exhibitions and innovative audience engagement. The 120,000-square-foot, $140-million building features two floors of gallery space and is the headquarters of The Broad Art Foundation’s worldwide lending library, which has actively loaned collection works to museums around the world since 1984. In its inaugural year, The Broad museum far exceeded attendance projections, welcoming over 820,000 visitors.